This one caught our eye right away. The shapely sweater uses ribbing to highlight features, with narrow ribbing at the collar, wider vertical ribbing on the body and sleeves, and horizontal ribbing on the dramatic bell cuffs and sweep. The combined effect of texture and silhouette is striking, modern and totally irresistible! The turtlenecks are Not tight and the sleeves are really stylish. Love the cut, fabric and length. They fit true to size. I bought three. 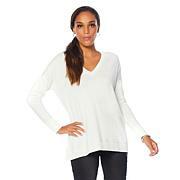 Liked it so much that I ordered another one in a different color!Stylish, soft and comfortable to wear! It fits like a dream.love the sleeves. I recommend this sweater. Ive been looking for the right turtleneck and finally found it! The cut and style are perfect; very flattering. 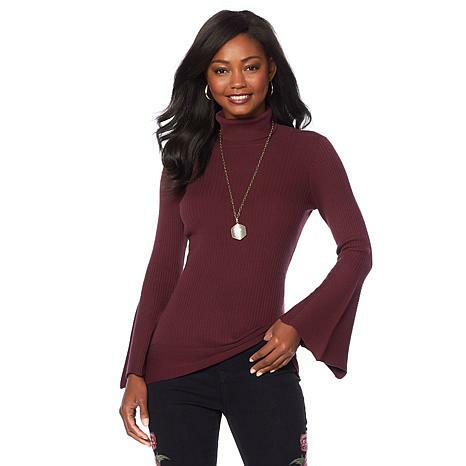 The turtleneck is not to tight, the length is perfect and the sleeves are beautiful. I love the fabric too. So soft!! !